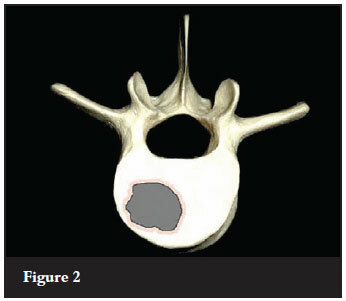 Primary spinal tumours make up 11% of primary musculoskeletal tumours, and 4.2% of spinal tumours.1 Six per cent of these spinal tumours are to be considered malignant.2 The intrinsic rarity of these tumours therefore make it very difficult for a single spinal surgeon to amass a large enough number of surgical cases to string together a valid and well-constructed series in a single career. The sparse body of available literature stems mostly from multi-centre research. Inappropriate treatment and incomplete resection not only increase the rate of recurrence, but have in fact been shown to be detrimental to the patient's survival.3-5 Thorough understanding of the principles involved as well as experience therefore limits the treatment of such cases to bigger centres with high enough numbers to be considered practised. The second tier rests on the containment of the tumour within the compartment of origin, with a tumour-site value assigned according to the local spread of the tumour. 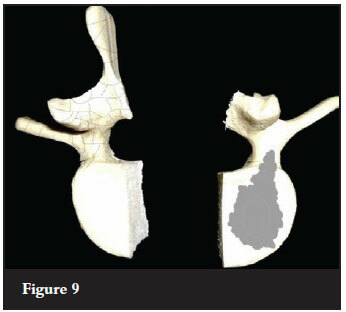 This is typically evaluated through imaging modalities such as computer tomography (CT) and magnetic resonance imaging (MRI) to clearly define the extent of bony destruction as well as infiltration of the adjacent soft tissues and compartments. Histopathological analysis of gross specimens (following excision) further confirms suspected local extent of tumour spread and infiltration. 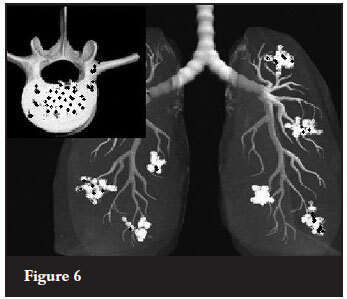 Distant spread is shown with whole body radionuclide studies or additional imaging modalities. A technetium-99m (99mTc) bone scan can detect lesions as small as 2 mm and will pick up on 5-15% alteration in local bone turnover. Bone destruction in both osteolytic and osteoblastic lesions can be identified 2-18 months earlier than traditional plain film radiographs. Plasmacytoma may present the unique problem in that it may be purely lytic, and therefore not detected by an ordinary bone scan. In these cases 99mTc-sestamibi has been demonstrated as a very useful modality with a specificity of 96% and a sensitivity of 92%. MRI as an alternative can be considered the standard in today's terms. Positron emission tomography (PET scan) with tracer fluorine-18 (F-18) fluorodeoxyglucose (FDG) is growing in prominence as a modality used in musculoskeletal oncology. This glucose analog tracer assimilated by glucose-using cells is phosphorylated by hexokinase (mitochondrial hexokinase is greatly increased in malignant cells with a rapid turnover). No further actions can occur in terms of aerobic metabolism within the cells, for the required oxygen on the tracer has been replaced by F-18. Most cells (with the exception of renal and hepatic cells) cannot remove the phosphate introduced by hexokinase because of the inherent ionic charge seen in phosphorylated sugars. This leads to accumulation and an intense radiolabelling of tissues with high glucose uptake, as is seen in most cancers. 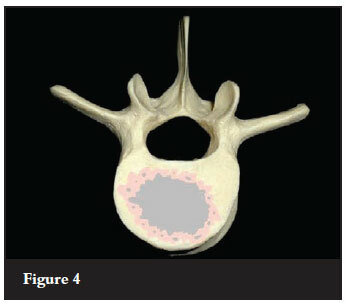 In 1997 Boriani et al applied the principles from Enneking's staging system in recommendations regarding primary spinal tumours.7 The presence of a pseudo capsule, skip lesions, extra-compartmental spread, metastases and lesion aggression determine staging of lesions specific to the spinal column. These lesions are usually asymptomatic and rarely require any form of treatment. The lesion in surrounded by a true containing capsule. A good example of a benign latent lesion will be a haemangioma - only requiring treatment if the lesion is causing pressure symptoms through neurological structure compression. These active lesions are slow growing with mild symptoms. There is a thin true capsule present still, with a thin zone of host-reactive tissue surrounding the lesion. 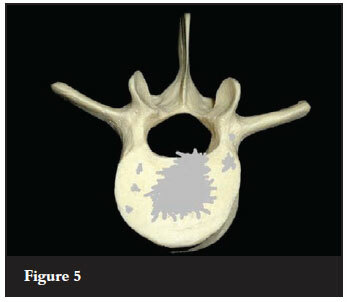 Good examples of such lesions in the spine would be an osteoid osteoma or an aneurysmal bone cyst. These lesions lend themselves to intralesional excision, with a low recurrence rate. Benign aggressive lesions display rapid growth, with a thin and incomplete capsule. There is prominent pseudo capsule established by a wide zone of host-reactive tissue. These lesions readily invade adjacent compartments. Intralesional curettage is not sufficient for these lesions and is associated with a high rate of recurrence. A wide marginal excision is indicated for such lesions. No true capsule is present in the case of these malignant lesions, with only a pseudo capsule of host-reactive tissue present. The pseudo capsule contains islands of tumour tissue. A wide en-bloc excision is indicated for a low grade malignant lesion. High grade malignant lesions display such rapid growth that the host tissue is not granted the opportunity to respond with a reactive tissue zone. These lesions therefore do not exhibit a pseudo capsule. Seeding with satellite tumour nodules and skip lesions are commonplace, with rapid tumour spread to adjacent compartments and the epidural space. 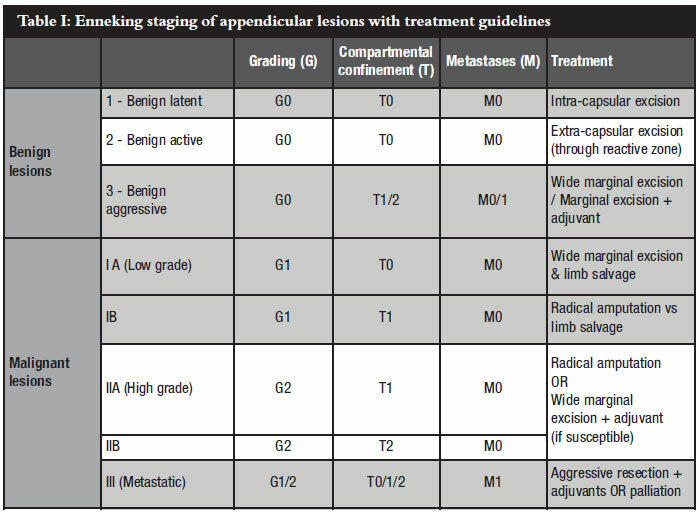 Wide en-bloc resection is indicated as treatment modality. These lesions are accompanied by spread of tumour to distant sites and organs, irrespective of histological grading. Treatment in Stage III lesions is largely palliative with dependence on adjuvants if perceptible and surgical management directed according to survival prognosis and direct symptoms such as neurological deficit. 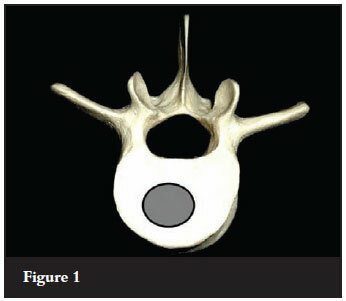 The WBB surgical staging system describes the involvement of a specific vertebra in terms of sectors involved, arranged clockwise in 12 sectors on an axial vertebral face. The lesion is further confined to five layers of tissue penetration denoted as A-E (see Figure 7). Longitudinal extent is described in numbers of vertebrae involved. Recommendations can be made regarding the most appropriate approach and procedure to allow for en-bloc removal of a neoplastic lesion, based on the sectors and layers involved in the specific case, including surrounding structures (as denominated by the tissue layers) as required for en-bloc excision of the lesion with an appropriate clear margin. Three procedures are advocated: vertebrectomy, sagittal resection and posterior arch resection. 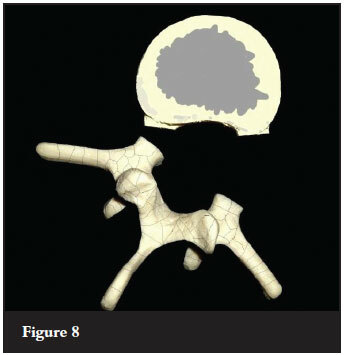 A vertebrectomy (Figure 8) is indicated for lesions in zones 4-8, or 5-9 with at least one pedicle free of tumour. This allows for a combined posterior approach, with the posterior elements removed in a piece-meal fashion. The unaffected pedicle allows for resection on the posterior aspect of the vertebral body, with the subsequent establishment of haemostatic control, as well as freeing of the posterior longitudinal ligament. 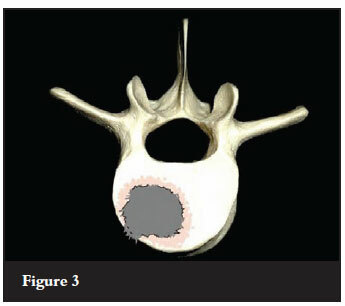 A second anterior approach is then utilised to remove the vertebral body containing the tumour in its entirety (en-bloc). 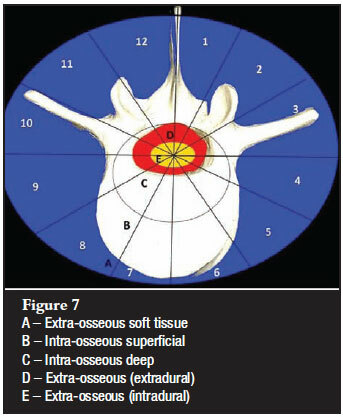 The sagittal resection (Figure 9) is indicated for unilateral lesions from zones 2-5 or 8-11, with the lesion possibly involving the pedicle or transverse process. Again through a combined approach the vertebral body will be split in a sagittal plane, allowing for a clear margin from the lesion. Subsequently a separate approach is used to remove the posterior elements of the unaffected side, allowing for the en-bloc removal of the lesion containing hemi-vertebra. 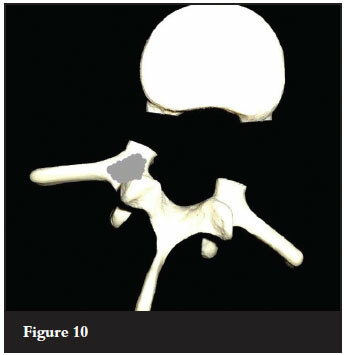 The posterior arch resection (Figure 10) is indicated for lesions restricted to zones 10-3. The posterior elements are resected through a single posterior approach, with the pedicles sectioned adjacent to the vertebral body to allow the removal of the posterior arch en-bloc. No benefits of any form have been received from a commercial party related directly or indirectly to the subject of this article.